Underway again...finally #12: OMG-I cut the free cabinets! Spent the day semi-waiting for a roofer. 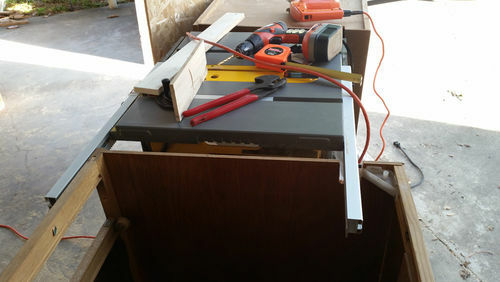 While I waited, I fiddled slowly with fitting the tablesaw fence rail guide and the cabinets. The fence extends further to the right than to the left. 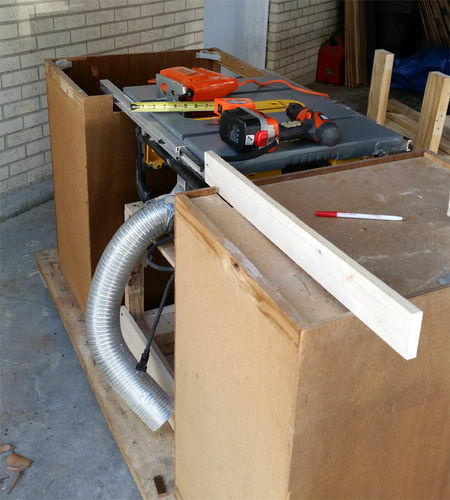 The cabinets are deeper than the tablesaw, so openings in both cabinets had to be made in order for the table saw fence rail guides to extend fully in both directions. 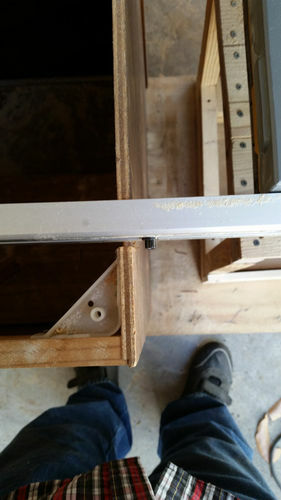 This (obviously) only needs to be done for the rear rail guides as I am mounting the cabinets so the tablesaw’s front rail guide passes in front of both cabinets. I thought I was taking my time and being accurate. Notice that I said, “I thought…” Well, I did take my time and still had to do it, re-do it and do it a third time. Story of my woodworking life it seems. Forgot to account for the fence alignment bolt head. This was an interesting “Fix” as I did it with the cabinets standing up, fully assembled. 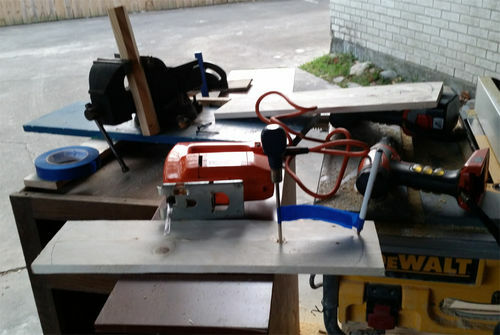 Making the cutouts would have been so much easier mentally had they not been assembled – that is, until I realized I just had to think about using the jigsaw as a reciprocating saw. Then it became much easier if not more accurate. Roofer came and gave us an estimate for resurfacing the carport – took much longer than expected and my mood changed during the “delay”. 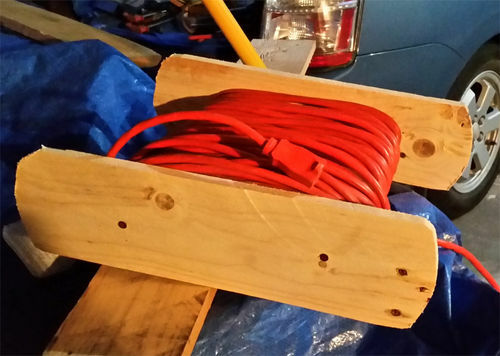 Finished up the short “workday” by making a kludge – something I’ve seen elsewhere for wrapping and storing electrical cords. I got the width wrong as I had no idea how wide the cord would wrap (shoulda just wrapped the cord from my hand to my elbow then measured the size of that….20/20 hindsight). I will shorten the middle pieces tomorrow. I know the end result looks “rough” – it is. I was cleaning up and just wanted to get something done. It’s much more functional than pretty (which wasn’t even a consideration). So, another short day. Small progress. Well, the guy said he MIGHT be out today… so, waiting but not waiting if you see what I mean now. Figured there was a >50% chance he wouldn’t show. GEAUX George! One of my all-time favorite comedians. As a species, we are less since he’s no longer with us. LOL. You can change your plans and alter your plans and it’s the same thing, but changing your pants and altering your plans isn’t.